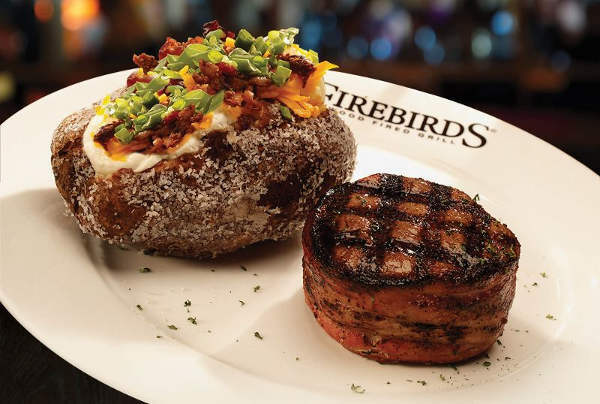 Firebirds Wood Fired Grill is located in Phoenix across from the Peoria Sports Complex and Harkins Theatre at the intersection of South of Bell Rd on 83rd Avenue. We are an American Restaurant and Steakhouse known for our scratch kitchen, bold flavors and inviting atmosphere. Enjoy our signature menu items including hand-cut, aged steaks and fresh seafood or our specialty crafted cocktails and select wines. Join us for Happy Hour at the FIREBAR ® or on the patio for drink specials and bar bites. We offer top-notch service and upscale dining at a modest price. Intersection of South of Bell Road on 83rd Avenue. Near Stadium Way and Arrowhead Fountains Center Drive. Across from the Peoria Sports Complex and Harkins Theatre. Close to Arrowhead Mall.